Kids were puzzled because they knew that the larger story of Native/European interaction is one in which Europeans forcibly removed and/or killed huge portions of Native populations. “They were there first. It is very unlikely that the boy just moved away.”Vanishing Indian = "detail"? This posting led to a lively exchange of views in the comments section. First, a defense of the book:I am all for diversity and truth in literature but not every single story has to contain all the details about every situation. 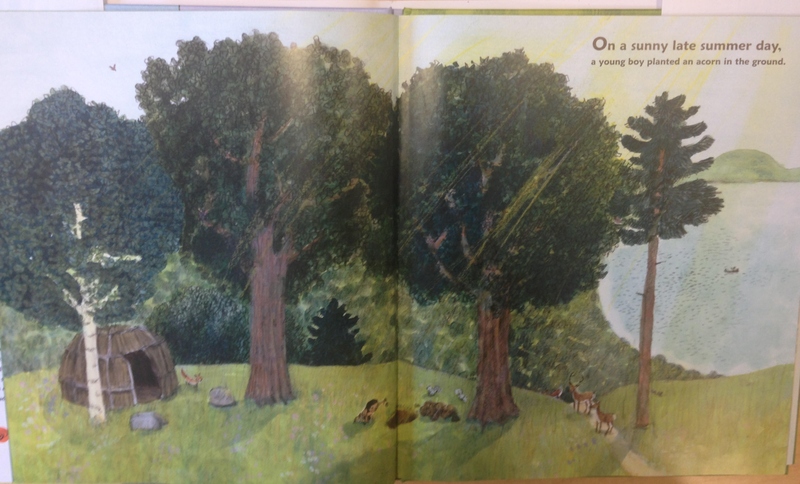 I’ve read this wonderful book–about a tree–and if you’re concentrating on how many wigwams are in the picture or whether the boy moved away or his throat was slit and he was buried in a mud bog, you’re missing the point. The story is about a tree. A tree that is manages to live long enough to witness a lot of things, good and bad. A child, reading about this tree does not need to know the details of what went on while the tree was alive. It’s inappropriate and distracting to include so much extraneous detail when the story is meant to be so simple and beautiful. I agree that children can and should be included in the true story of what goes on in life….in the appropriate venue. G. Brian Karas is a wonderful author and a gifted artist and I hate to see his work held hostage by people who wish he’d made their choices. It’s part of the trend of censorship in the guise of political correctness. His book, his choices. Mr. Karas, you’ve created an amazing book. Don’t bend over backwards to please everyone else. You’ll only end just bending over.Followed by a rebuttal:The fact that you dismiss the history of violence that Europeans enacted against Native populations as “details” that cause me to “miss the point” of the book sends the message that you, in fact, are missing the point of this post. The point is, with simple adjustments to the pictures and the text (adjustments which the kids suggested themselves), the book could have been more respectful towards Native populations, not to mention more historically accurate–an important factor for a Non-Fiction book. Including the truth about Native/European interactions would not have subsumed the rest of the book, it would have made for a better book. You say, “A child, reading about this tree does not need to know the details of what went on while the tree was alive.” But, a Native child might pick up this book and immediately recognize it as an erasure of his/her history. For that matter, a Native child browsing the internet might also stumble across your comment above, in which you so blithely characterize “whether… his throat was slit and he was buried in a mud bog” as a “detail” that doesn’t matter, and is, in fact, “inappropriate and distracting.” How do you imagine a Native child would feel, upon reading that? Debbie rightly points out that this language and the sentiment behind it are extremely offensive. It sends a message that white people have the right to cling to a false, Romanticized version of history. Ultimately, it sends a message that non-Native people matter more than Native people. Finally, your accusation of censorship is both false and hypocritical. My post makes no suggestion that any libraries or bookstores should remove AS AN OAK TREE GROWS from their shelves, nor do I suggest that anybody should not have the right to write or publish anything they desire. In fact, my first post of this series (https://bankstreetcollegeccl.wordpress.com/2015/08/10/kids-thoughts-on-censorship-loudness-in-the-library-year-three-part-1/) is all about censorship. You are confusing free speech with consequence-free speech. Just as the creators of AS AN OAK TREE GROWS had every right to publish this book, I also have every right to criticize it, and so do the children I teach.Comment: Forget the slit throat--if you can. How would Native children feel after reading that their ancestors gave up their land voluntarily? Welcomed their own destruction? Vanished willingly into the mists of time? I dunno. How would white children feel if the Europeans sprouted horns? Laid eggs? Turned into cockroaches that swarmed across the land? If Native children have to accept lies and omissions in "nonfiction" books, why shouldn't everyone have to do it? What makes the Native-oriented falsehoods more acceptable than the European-oriented ones? For more on vanishing Indians, see Native Artifacts Aren't Antiquities and America Constructed to Erase Indians. Reminds me of this, which I had to memorize as a kid...and which teachers are apparently still using. Worse, the website labels it "Native American poem." Gawrsh, where'd they all go?